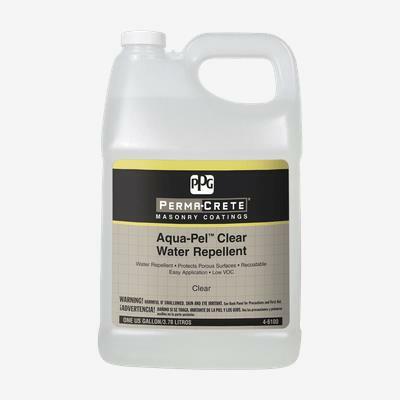 PERMA-CRETE® AQUA-PEL™ Interior/Exterior Clear Water Repellent is a waterborne, penetrating, non-film forming product ideal for use on interior/exterior, above-ground, vertical and horizontal surfaces. This product provides excellent water repellency to reduce cracking, spalling, freeze/thaw and chemical damage, mold and mildew growth and dirt pick-up, thereby lengthening substrate life and reducing maintenance cost. PERMA-CRETE® AQUA-PEL™ is ideal for use primarily on architectural concrete, concrete block, splitface block, pavers, stucco, porous and dense brick, clay tile, exposed aggregate concrete, sandstone, and slate.